The Status Info Dashlet has been available on the Nagios Exchange website for about a year now. It is a very cool dashlet, that in my opinion, doesn’t get the attention it deserves. The Status Info Dashlet allows you to display the current status of a service as a dashlet on a dashboard in nice big numbers, and is especially useful in cases when you want to keep an eye on a problematic service. and clicking on the “dashify” icon in the upper left corner of the dashlet to add it to a Dashboard . You will see the “Add To Dashboard” interface, which has many different options, allowing you to customize your dashlet. The first three options on the top allow you to set the dashlet’s title, the dashboard, where you would like the dashlet to be added to, and the refresh rate. Below these three options, you will see eight tabs for even more customizations. I will go through each one briefly, and describe the most basic choices. 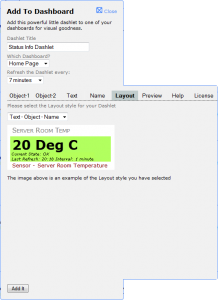 Here you can select the object (service), that you want your dashlet to use. You also have an option to show the current service status as text, set the background color, “trim” the output (the beginning or the end), in order to discard the information that you don’t need. You can also show the last refresh time and the refresh interval underneath the object. From here, you can add additional text to your dashlet and style it how you want. This allows you to select how you want the dashlet displayed. There is a drop-down menu with a various combinations for displaying “Text”, “Object”, and “Name”. When you click on this tab, you will see a preview of what your dashlet will look like. The help menu explains in details the various options that exist in each section/tab. Here you can read the license for this dashlet. After you selected all of the options you want, just click on the “Add it” button on the bottom. Then you can go to the dashboard, where you added that dashlet and view status info for your service. 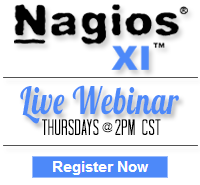 You’ve now successfully added the Status Info Dashlet to your Nagios XI views. It’s as easy as that. Category: Components, Cool Stuff, Nagios XI and Visualizations. Closed Tags: Customization, Dashboards, Dashlets, nagios, Nagios Exchange, nagios xi, Status Info Dashlet, Visualizations.